One of the cool things about blogging is I feel obligated to complete the projects I write about. Maybe you all do not really care (ha!) but I feel a sense of obligation to finish things or my readers will think I am a…non-finisher (not even sure if that is a proper word). 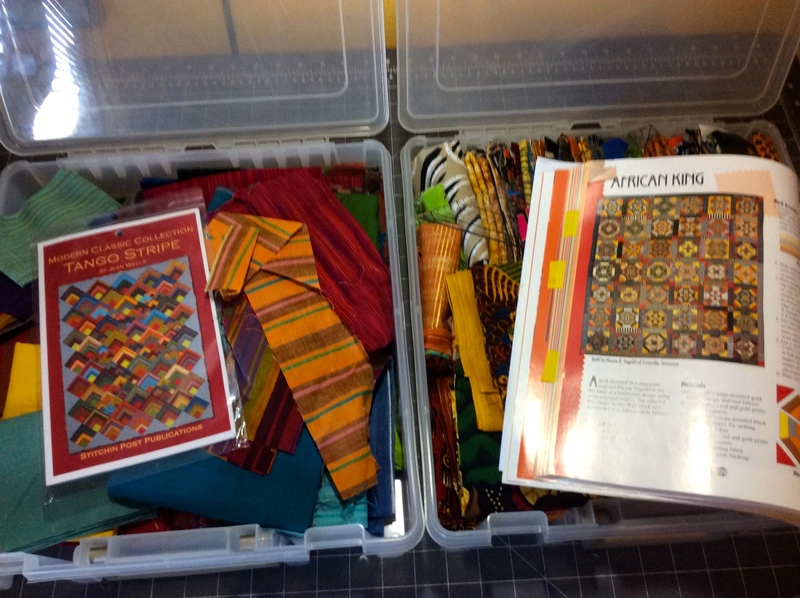 In my posts What’s on the Design Wall: Rediscovering My “Charms” and What’s on the Design Wall: Pre-cuts Wrangling, I discuss trying to use up my out of control collection of pre-cuts such as charm squares (5 inch pre-cut coordinated squares). Another charm square quilt has been completed – this one I call The Charming Continues. It was pieced by my quilting husband and myself using a couple Moda Basic Grey charm packs and coordinating Moda Basic Grey/Grunge line of fabric. It was long-arm quilted by Betty Anne Guadalupe of Guadalupe Designs. Originally I was going to list it on my Etsy shop but I fell in love with it and it is very happy now in my cozy reading area (where the 370 Craft Books live, see that post…). 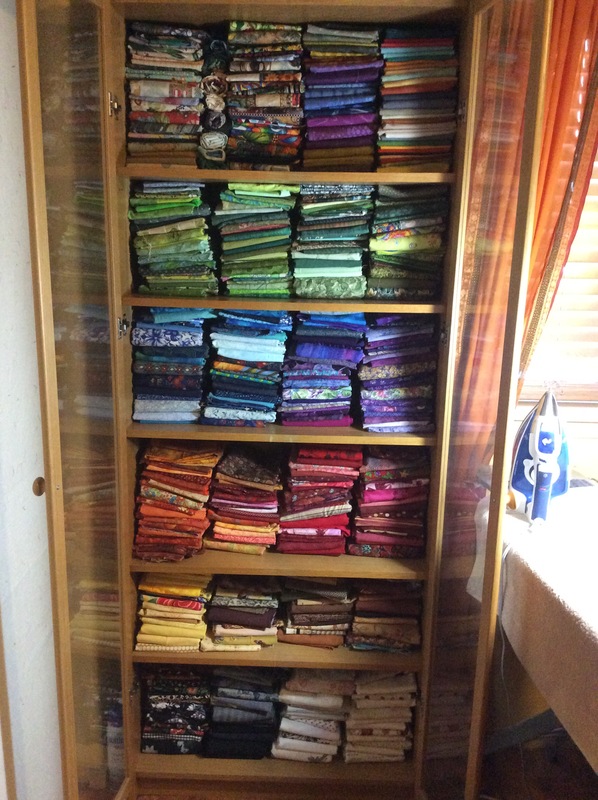 In a recent post, What’s on the Design Wall: Not What Should Be There, I discuss how at a recent quilt retreat, I began impromptu working on the same quilt another retreat attendee was piecing – the pattern Right on Target. I have now completed piecing the top and now I am deciding whether to use it as a quilt or as a quilted tablecloth. I am going to quilt it myself (just a simple “stitch in the ditch” or “stitch outside the ditch”). I am happy it did not become an UFO (unfinished object) – this can happen to random projects you start on an impromptu basis at a quilt retreat! In my post Craft Book Hoarder I mention my discovery that I now have 370+ craft books. If I have that many craft books, you might suspect I have a lot of crafting magazines. I used to have a ridiculous amount of crafting magazines, especially quilting magazines. I had a subscription to 4-5 quilt magazine publications (plus the quarterly and annual special publications I would pick up at a quilt shop) and I would hold onto every issue in case there might be a pattern I might want to make someday or a helpful quilting tip. I had the same issue with Beading magazines and even for a while Scrapbooking magazines! A couple of years ago, over a series of several weeks, I made myself go through every magazine and clip out only the patterns I would actually make and only the tips that I would refer to over and over again. Then I put them in a large binder in sheet protectors. I was so proud. I thought I had conquered paper clutter. Then this huge binder sat on the shelf, with all those nice patterns and tips inside, unloved, untouched, unused and gathering dust. I had started downloading free and purchased patterns from the internet and storing them on my laptop. I did cancel all my quilting magazine subscriptions (because seriously, how many new and unique patterns are there to find after a while?) but for any additional magazines that trickled in, I would just scan the pattern I wanted and then donate the magazine to the Humane Society Thrift Shop. IT WAS TIME TO GET RID OF THE PAPER! 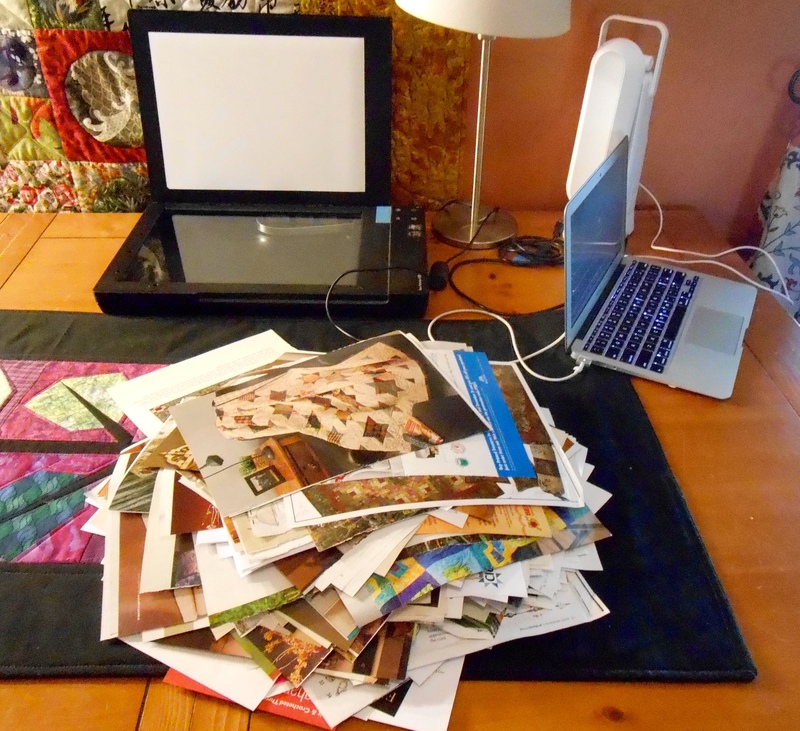 So now a new huge project has commenced: I have removed all the paper patterns from the sheet protectors (donated the mega binder of sheet protectors to my favorite thrift shop for the next organization victim) and I am going to SCAN them all into my laptop and then recycle the paper! Then I can organize all the patterns for quick access..and…maybe actually USE them. I am a woman with a plan and ready to SCAN! Check out Sassy the highly opinionated miniature schnauzer’s blog on the page Schnauzer Snips for her latest thoughts and adventures. This is the last of my series of posts on the 4-day quilting retreat I attended last weekend. In my post Getting Ready to “Retreat” I shared photos of the projects I was bringing to the quilting retreat to work on during the retreat. So one would expect that they would see on my Design Wall a work in progress (or near completion) that I worked on during the retreat – right? What is on my Design Wall is what should not be on my design wall: a quilt I started at the retreat because someone else was working on it and I liked it! This is how new UFOs (unfinished objects) are born! My Quilt Sister Barb was working on a pattern called Right on Target by A Quilter’s Dream (2013) at the retreat. 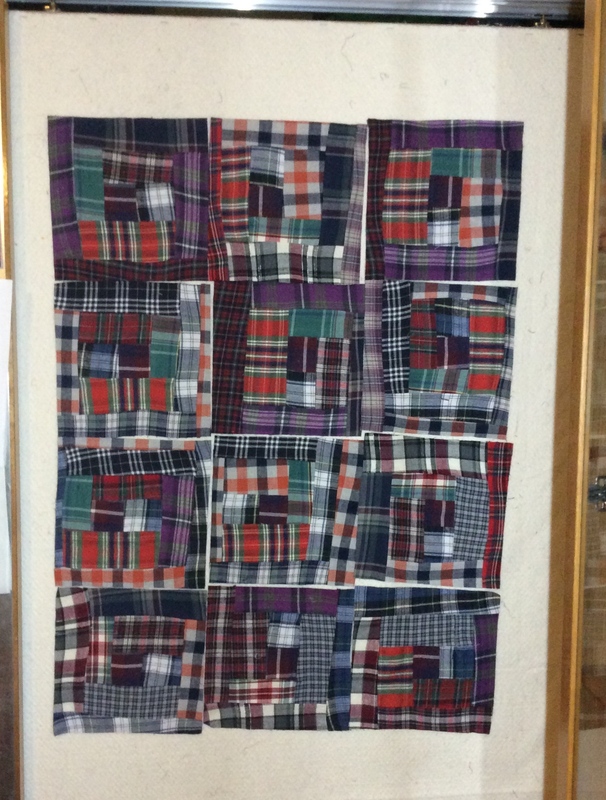 It involved taking 2 1/2 inch strips from say a pre-cut jelly roll and making a quilt by essentially making one giant log cabin square-in-a-square block. I happened to have a Hoffman Bali Pop on me (a set of 40 pre-cut 2 1/2 inch coordinated batik fabric strips) which was perfect for this pattern. Next thing you know, I had abandoned what I was working on for the afternoon at the retreat and borrowed her pattern and started making the same quilt! Of course this only reinforces what I discussed in my post Creative Inspiration: What Others are Working On! I know I am not the only quilter to do this – there is something so engaging when you see a quilt in progress that is very appealing and the pattern is very easy! What became of the projects that I brought to the retreat? Well the two UFOs in boxes (in the photos in the Getting Ready to “Retreat” post) I did not even touch (I guess I brought them as decoration for my assigned work table). Instead I worked on a log jam project (refer to my numerous posts on Log Jamming), started a new project as mentioned above, went on a quilt store shop hop, ate way too much naughty food, and in general goofed off and visited with quilt friends. My kind of retreat weekend! In my post Getting Ready to “Retreat” I shared my excitement on heading to a 4-day quilting retreat with my quilting friends from WA, OR, and CA. This next series of posts will be about that 4-day retreat. Last May I attend the Sew N Go Retreat in Vancouver, WA (outside of Portland, OR) for the first time. I live about 3 1/2 hours from Vancouver, WA and I drove to the retreat with a friend who was also attending. Last Thursday I returned to the retreat, and this time I drove alone. I was bummed, at first, to drive alone this year to the retreat. All I could think was: “3 1/2 + hours in the car, not fun”. I was wrong. Road trips with friends are great, however it can be quite fun to go on a road trip alone! Along the highway on my trip I would find “Car Buddies“. For more years then I remember I have always been into finding imaginary “Car Buddies” when on long drives. What are “Car Buddies”? Car Buddies are other cars that you follow for a long period of time. If you are on a one lane highway and a passing lane appears, you do not pass them, They are your buddy and you stay behind them maintaining a reasonable speed. The most appealing car buddies of course, are those who are going an acceptable speed! Sometimes if I have been with a car buddy for a long time on the road I get kind of sad for a moment when they take an exit that I am not taking. I always say aloud: “bye-bye car buddy, thanks and take care!” Yes I am weird. I have imaginary friendships and connections with other cars on the road. Just returned from a 4-day quilt retreat with my quilt sisters and I will blog more about that later. I am still unpacking and sorting out the damage from our mini quilt “shop hop” during our retreat. It insulates the closet where it is kept. It is less expensive and more fun than psychiatric care. A sudden increase in the boll weevil population might wipe out the cotton crop for the next 10 years. 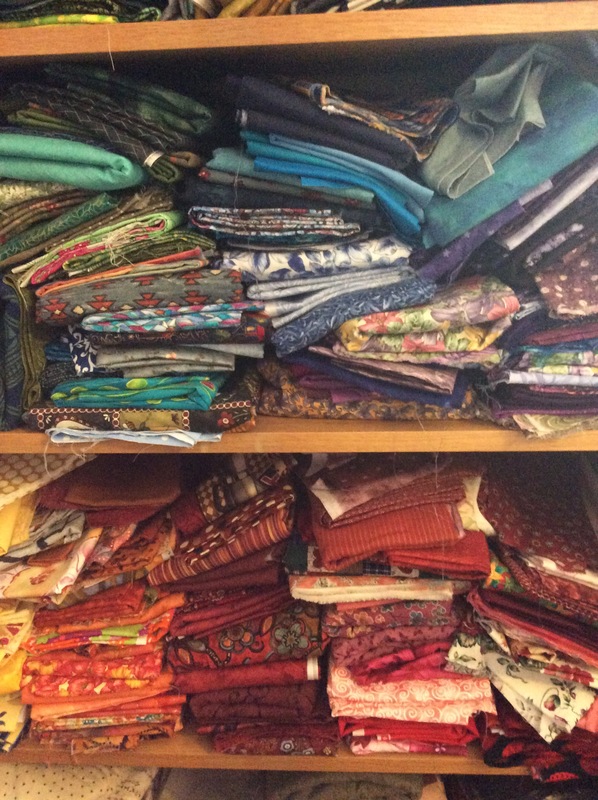 I’m participating in a contest – the one who dies with most fabric wins! It’s not immoral, illegal or fattening. It calms the nerves, gratifies the soul, and makes me feel good! Buy it now, before your husband retires and goes with you on all your shopping expeditions. It helps keep the economy going. It is our patriotic duty to protect the jobs of textile mill workers, and quilt shop staff with cute babies and grandchildren. It keeps without refrigeration, you don’t have to cook it to enjoy it, you never have to feed it, burp it, change it, wipe its nose, or walk it! This post continues my discussion and exploration of my sources of Creative Inspiration. In my previous post on creative inspiration I discussed Temperature. Now I am ready to explore color as a source of creative inspiration – but not just any type of color – I am inspired by strong and bold color! I am attracted to soft muted colors and I daydream of making a quiet modern quilt in pale blues, light creams, soft yellows and maybe a touch of light pink. However I am not inspired by these colors and I rarely used them in such a muted combination. I am inspired by the POW, the BAM, the WOW of strong and bold color! Below is a quilt I made a couple years ago that I will call Asian Fabric Slideshow. It has no actual name but the name of the pattern is Slideshow and it is a fast and simple pattern. 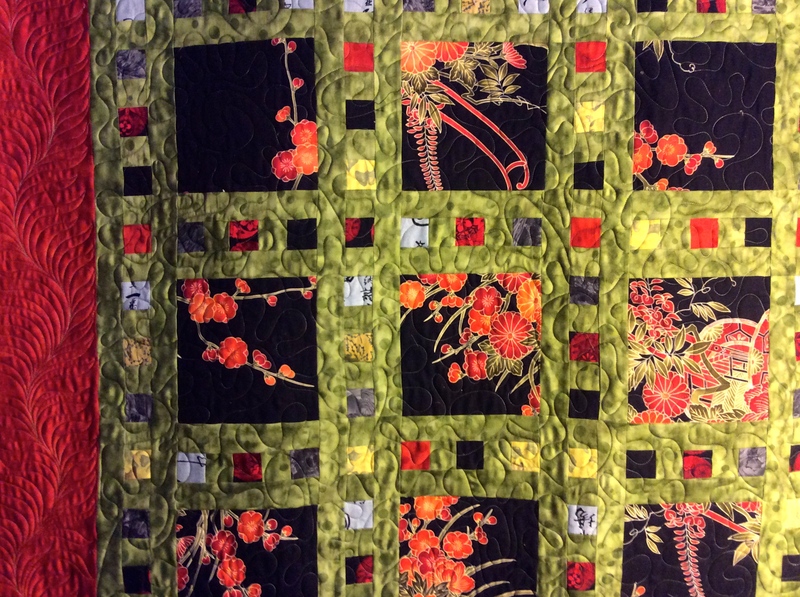 However, the quilt does not look like a quiet simple quilt – it is made with a very bold color combination: vibrant deep orange and bold electric green. On one hand I don’t know what the heck I was thinking when I chose this combination of colors but it looks spectacular on the wall. I get a lot of compliments on this quilt which is featured in my living room. I wanted to return to my series of posts exploring my Sources of Creative Inspiration. 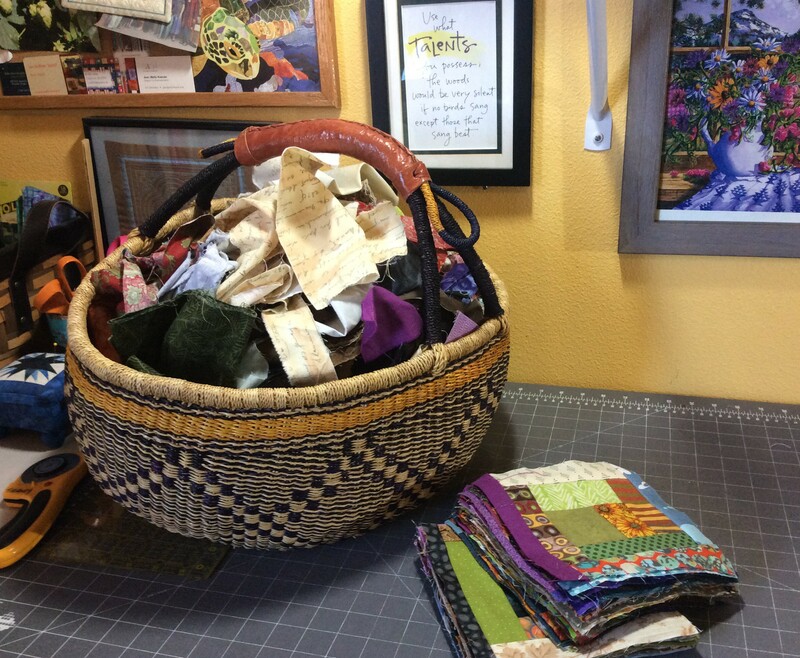 In the previous post in the series, I explored Creative Inspiration: Quilting Mentors. This time I want to explore “Temperature” as a source of creative inspiration. Temperature? Like the outside weather temperature or the temperature of the room you are crafting/quilting in? Or like if you are “running a temperature” because you have a fever? No. When I refer to temperature, I mean the temperature that the color combination in a piece evokes in you. Does it make you think of a chilly winter day or a hot summer day? Does a grouping of colors give you the sense of cool and relaxing or warm and vibrant? Example: if you think of a palette of light blues and light creams you might naturally think of “cool”. While deep reds and oranges together in a grouping might make you think “warm” or “hot”. Last year temperature inspired a piece I created called It’s Getting Quite Warm In Here. As you see below the piece has a lot of red, orange and yellow in it, as well as sharp edge/points representing small flames. I was planning for it to be part of a series I planned to call: So How is the Temperature? where each piece would give you a feel of a range on a temperature scale: freezing, cold, cool, warm, hot and burning. Now that I revisit this piece with this post, it might just continue on with the series (so many ideas swirling around in my head). It’s Getting Quite Warm in Here (2014). Designed and pieced by Tierney Davis Hogan, quilted by Betty Anne Guadalupe. *The shirt flannels were rediscovered during part two of my purge of fabric (see post The Fabric Purge!). This time I worked through my flannels and weeded out those no I no longer needed and rediscovered my tucked away collection of shirt flannels.